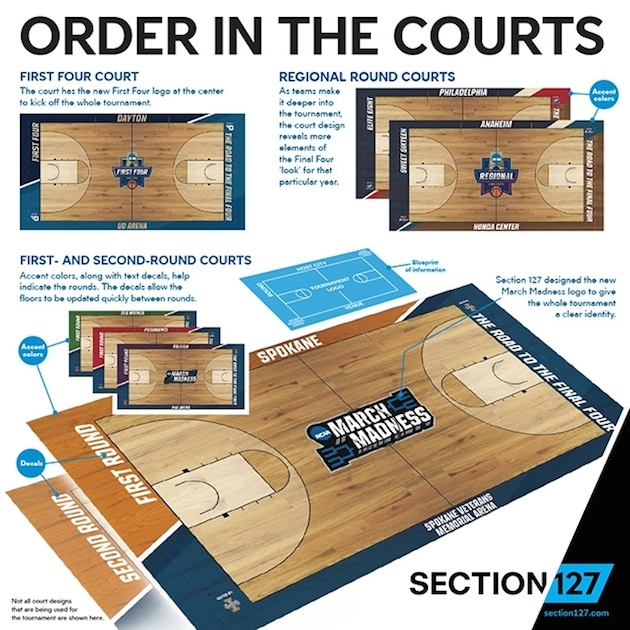 The NCAA tournament will have a new look this season, as the court design at tournament sites will be changing. Starting in 2007, all games starting with the Sweet 16 were played on courts with the same design—a light-colored floor with blue paint at the top of the key and the host site written in blue on the baseline. Beginning in 2010, all tournament games until the Final Four were played on courts with that design. The new court design replaces the NCAA logo at midcourt with a March Madness logo, and the host city and arena name are now written on the sidelines. Each court has a slightly different color scheme, which the NCAA says will help TV viewers differentiate the sites as they flip from game to game. The NCAA released the full designs on Tuesday. The tournament begins with the First Four on Tuesday in Dayton.